Grey's Anatomy is the recipient of the 2007 Golden Globe® Award for Best Television Series – Drama, and multiple Emmy nominations, including two for Outstanding Drama Series. Download Grey's Anatomy in Digital HD from the iTunes store. Grey's Anatomy images are © ABC Studios. All Rights Reserved. Grey's Anatomy came onto the TV scene, believe it or not, over 9 years ago and during that time has garnered a strong and loyal following. Mostly, the audience for this show is women which isn't so surprising when you take a closer look at the plot of the show. Take a few handsome television actors, make their characters good and noble with just the right amount of "bad boy" mixed in and your female audience will swoon. Having one of your main characters adopt the habit of nicknaming every male doctor (McDreamy, McSteamy etc) and you have the right recipe for a hit. With DVD having hit its stride, many shows have found their way into homes via season collections and even box sets. This makes it great for die-hard fans who love re-living past episodes. With that, here is a review of Grey's Anatomy Season 9. Season 9 follows the story of surgical interns, residents and their competent mentors, as they experience the difficulties of the competitive careers they have chosen. It is set in the surgical wing of the fictional Seattle Grace-Mercy West Hospital, located in Seattle, Washington. A major theme of the season is the characters adapting to change, as all of the fifth-year surgical residents have turned into surgical attendings, and are now teaching interns, and operating on their own surgeries. The early episodes of the season depict the characters dealing with the aftermath of the season eight plane crash that claimed the life of Lexie Grey (Chyler Leigh) and upon rescue Mark Sloan (Eric Dane), who dies in the first episode. Derek Shepherd (Patrick Dempsey) finds his surgical career in doubt after badly damaging his hand but ultimately his sister Liz (Neve Campbell) donates a nerve from her leg and Callie Torres (Sara Ramirez) is able to save his hand. Later, Shepherd receives more good news when his wife Meredith Grey (Ellen Pompeo) discovers that she is pregnant, despite her previously being told that it was unlikely that she could conceive. 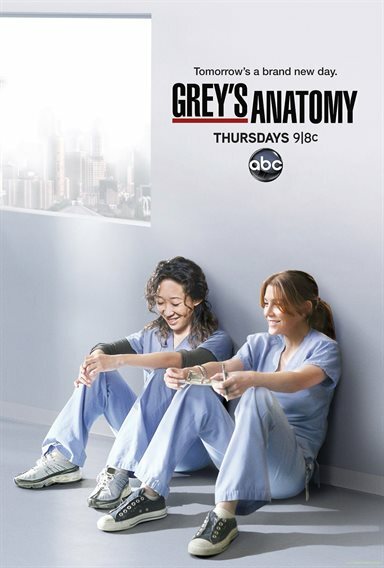 Cristina Yang (Sandra Oh) is severely traumatized upon rescue and suffers from brief reactive psychosis and eventually decides to take up her fellowship in Minnesota, though soon grows unhappy in her new surroundings and returns to Seattle after the death of her friend and mentor, Doctor Thomas. Arizona Robbins (Jessica Capshaw) survives the plane crash in spite of her leg injury, but upon return her wound becomes infected and her leg has to be amputated to save her life. Robbins reacts badly to this, becoming bitter and blaming her wife Callie and her former friend Alex Karev (Justin Chambers) and refuses to leave her bed or return to work. Derek discovers that prior to the plane crash, the hospital had recently changed airlines to one with a poorer safety record for budgetary reasons, resulting in the four crash survivors (Grey, Shepherd, Robbins and Yang) deciding to pursue a lawsuit, and it soon becomes apparent that chief of surgery Owen Hunt (Kevin McKidd) had given the go-ahead to the change. To prevent the doctor's court case from being thrown out, Hunt decides to divorce Yang, but the two secretly resume their relationship and agree to start again. Despite contemplating a settlement, the doctors decide to continue with the lawsuit and eventually are awarded fifteen million dollars each, but the insurance company discovers an unexpected loophole and refuses to pay, resulting in the hospital itself becoming liable, putting its future in extreme doubt. Dr. Alana Cahill (Constance Zimmer) is appointed to cut costs at the hospital and she eventually decides the best course of action would be to seek out a new buyer and attracts the interest of a company named Pegasus. Later however, Torres and Richard Webber (James Pickens Jr.) discover the unpleasant consequences that would fall upon the hospital should they be taken over by Pegasus prompting the four crash survivors (and Torres on the behalf of Sloan) to pool their money together in a bid to purchase the hospital themselves and quit their jobs, resulting in Pegasus pulling out. The doctors run into trouble when they fail to secure an extra benefactor, but at the last minute Catherine Avery (Debbie Allen) reveals that the Harper Avery Foundation is willing to provide a majority share in the company, on the condition that they have at least one member on the board of directors. The doctors agree and their purchase is complete, only for Catherine to appoint her son Jackson Avery (Jesse Williams) to part of the board, effectively putting him in charge of the entire hospital. In other storylines, Miranda Bailey (Chandra Wilson) marries her partner Ben Warren (Jason George), despite suffering from last-minute nerves and missing the original wedding ceremony due to Adele Webber (Loretta Devine) being admitted to the hospital. Adele later dies after her surgery, leaving her husband Richard wracked with guilt due to his relationship with Catherine Avery. A new group of interns arrives at Seattle Grace and soon Karev strikes up a close friendship with Jo Wilson (Camilla Luddington) but the pair fall short of developing a romance, despite other characters commenting on their chemistry. 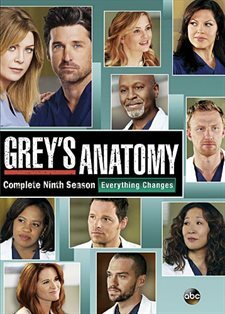 After failing her board exams in season eight, April Kepner (Sarah Drew) returns home to Ohio, but is later brought back by Hunt and resumes her job at the hospital. Upon her return, Kepner restarts her sexual relationship with Jackson, despite being filled with conflict due to her religious beliefs. The pair eventually split up when Kepner refuses to make a commitment, and Avery starts dating intern Stephanie Edwards (Jerrika Hinton), while Kepner starts dating a paramedic named Matthew (Justin Bruening). A lot of what makes Grey's Anatomy so entertaining for most is also what makes it so frustrating for the rest. Many of the episodes, besides focusing on the intense drama of the emergency room also put a premium on the day-today minutia of inter-personal relationships. Certainly that has its place and can make for good storylines, certainly engrossing drama. But it all feels very forced, perhaps heavy even and that can put off more cynical viewers. Still, we all have our likes and dislikes and clearly Grey's has found its niche. Considering its been on for 9 years, they must be doing something right! Being a standard version DVD, you can't expect too much from this. Video looks good, though there is clear static to the picture, with blacks and hues looking a bit too faded. The "pop" of Blu-ray is definitely missing here and that's a shame because there are certain episodes on here that would benefit from it. Audio is more impressive, with 5.1 Dolby Digital Surround Sound, there is very little lost. No background hiss, or pops, and dialogue comes through quite clear. The only drawback would be that this isn't a show of big action or explosions so your speakers won't get much of a workout. Happy Trails with Jim Pickens Jr – Saddle up with actor Jim Pickens Jr. (Dr. Richard Webber) as he shares his love for the cowboy life, and how he channels that passion into the charitable foundation he's set up. The Long Road Home – Jessica Capshaw shares how she adapts to all the challenges of playing a character who's lost a limb. Grey's Anatomy isn't for everyone, we've established this. However, after watching an entire season of the show, you can see why the series has lasted this long. Complex storylines, complex characters, and constant changes happening with each season, it's a wonder that the actors can keep up with all of them. Being a fan of the show must be equally as challenging! Starting the season after a heavy cliffhanger and ending with a Hurricane Sandy style finale episode, Grey's continues to keep the fans fully engrossed and on the edge of their seats. If you're on of them, then you'd be doing yourself a serious favor by going out and picking up this set.